My students are starting to have a lot of missing assignments. What can I say... it's that time of year. 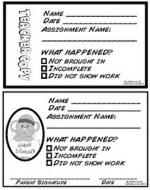 So, over my Thanksgiving break, I made this cute little mouse missing homework record sheet. I figured others might be having the same problem, so I posted it in my store on Teachers Pay Teachers. So, I've finally had time to make a color-by equation activity I've been thinking about for a while. You can find it HERE in my TPT store. It's a winter holiday color-by-number for 5th-7th grade math students. This activity has numbers represented by equations. For example, the number 12 might be represented by the square root of 144; 2 squared times 3; 3 to the second power plus 3; 48/4; or just the number 12. In order for kids to enjoy this activity, they should understand exponents and square roots, as well as order of operations and different ways to represent multiplication and division (dot, x, fraction, slash, division symbol). This activity should not be used for students with trouble seeing small numbers or for children with dyslexia or dysgraphia. Picture depicts a bunny rabbit bringing presents to put under a decorated pine tree in the snowy woods. 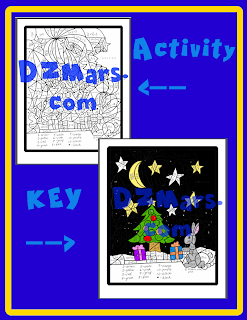 File includes worksheet, colored key, and copyright page. Roughly 1/2 of the numbers are hand-written and the other half are in a hand-writing font. Welcome to D.Z. Mars! This is my personal blog, where I will link to article I've written; products I've created for Teachers Pay Teachers, Zazzle, and Etsy; and random how-tos and daily events from my life.